I love beer. More specifically I love hand-crafted ones, with robust flavor, color, heart and soul. While I enjoy a Corona or standard lager once in a while, it’s generally ales, stouts, interesting seasonal brews and the odd white wheat that really get me excited and thirsty. For more than a decade-and-a-half my favorite beer has been Traditional Ale, brewed by now legendary and once-micro-brewery Big Rock. Located in Calgary, Canada, in many respects Big Rock helped lead Canada’s now dynamic micro-brew scene. Their beer can be found in most spots across the country and even in Seoul, Korea where I was lucky enough to enjoy a couple pints while researching a travel guide for Groovy Map in May 2012. My friend Peter Dolan worked with Big Rock for eight years and I was the lucky recipient of the odd hoodie, shirt and most importantly a few cans of beer when someone from Calgary would come to Thailand for a visit. Being far away from home is never easy and good beer is one of the things I miss most. When I saw an announcement from Peter in April 2013 that he was leaving Big Rock for a new brewery I was a bit disappointed knowing my personal connection with my favorite ale was now gone. That quickly disappeared when he invited me to a Wednesday afternoon session of sampling in early April at Village Brewery, his new place of employment. Located in an industrial area in Calgary’s southeast, Village is small, cozy and exudes a friendly vibe the moment you enter the front door. Offices are on the ground level and I was invited to venture upstairs where the real reason I came waited – open taps. 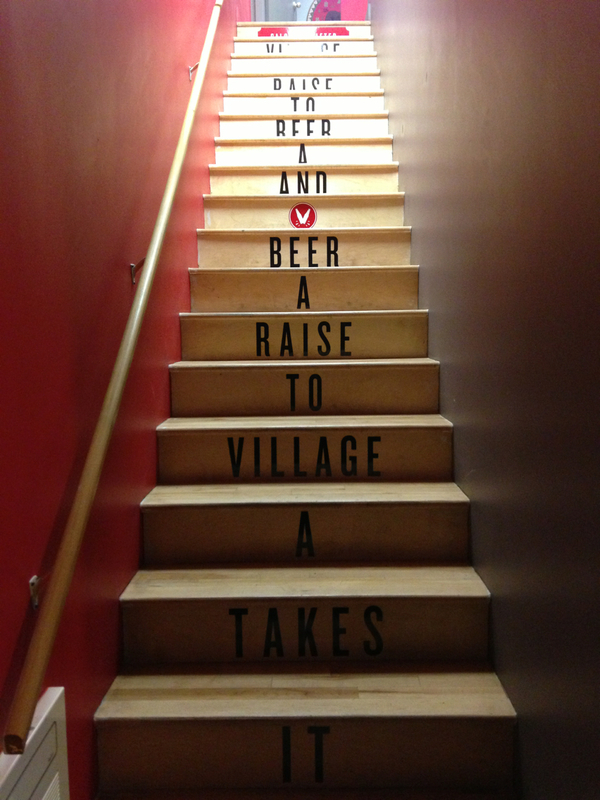 Creative phrasing adorns the stairs, and there began the application of the first layer of Village spirit that was to win my heart over a couple hours. 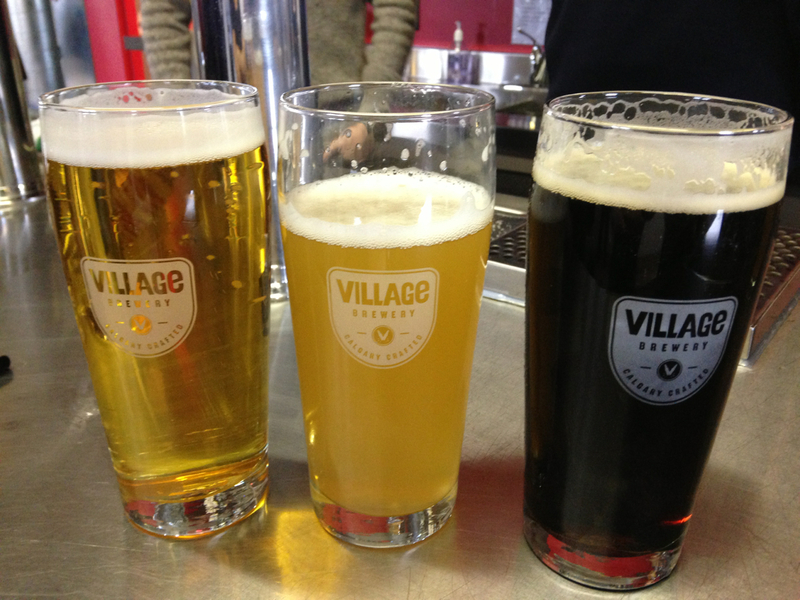 Upstairs is home to a nice bar overlooking the brewery below, with four taps, room to accommodate about 40 guests, bright wooden floors and smiles from what I was to learn are three of the seven founders of Village. With 150 years of brewery experience between them, they bring a formidable force to Calgary’s newest entry in the micro-brew scene. Co-founder Tom poured me a Blacksmith India Black Ale, which quickly warmed me up from the still not-so-Spring-like-conditions outside. While almost black in color, it wasn’t too heavy, a tad hoppy, but not overly as one would expect from an IPA. My heart was warming. Peter took me downstairs for a look at the brewing/bottling area, pointing out newly acquired equipment from Germany, featuring mostly German language on the controls, which they’ve hand-written translations for to ensure Canadians don’t push the wrong button. 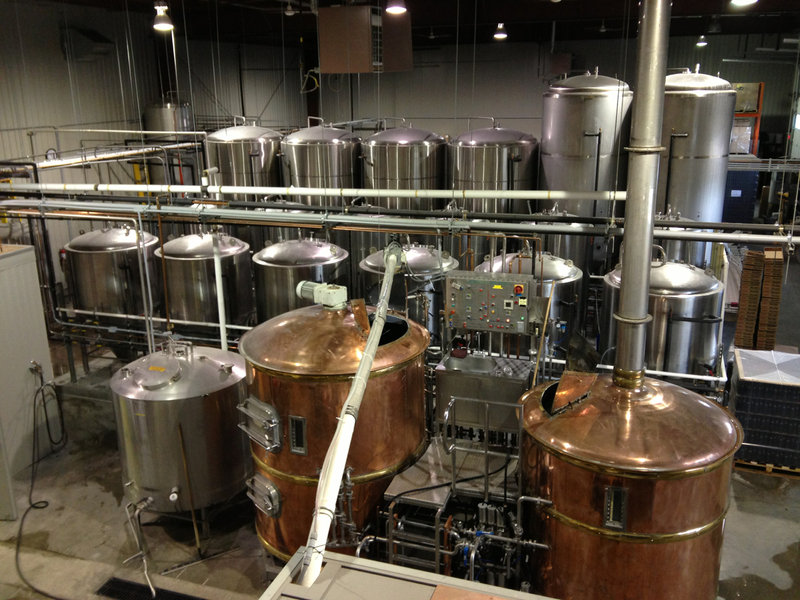 It was on the brewing floor I had the pleasure of meeting Larry Kerwin, Brewmaster at Village. His easy demeanor made me feel right at home and we had a good conversation about his time at Big Rock brewing my favorite Traditional, a brown ale. With more than 40 years experience he’s excited to be back to the basics of craft brewing and is very confident of their three mainstays: Blacksmith, Village Wit – a white wheat ale, and their top-selling Village Blonde. He shared my enthusiasm for brown ales and hopes to have one under the Village banner in the not-too-distant future. That said, keeping Village small and accessible is what they’re all about Kerwin reminded. While enjoying great success in the city, they’re quite happy to be Calgary’s brewery and not try to take on the entire nation. As a point of comparison Big Rock produces 200,000 hectoliters annually, another Calgary micro-brew darling Wild Rose produces 10,000hl and Village knocked-out 2,000hl in 2012. Over the next two hours roughly 30 interesting, entrepreneurial and eclectic friends of the Village crew drifted in for a pint. They were intriguing and are part of building Village’s foundation of community, something they’re passionate about. In addition to the seven co-founders they have 50 Beer Barons, Calgarians who have contributed significantly to the city’s social fabric, and are small stakeholders in the venture. 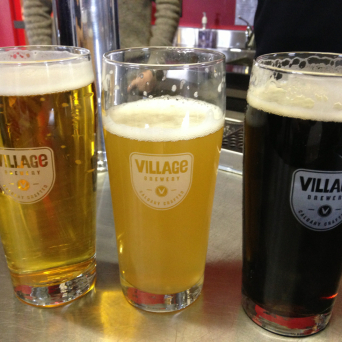 Currently Village welcomes friends to tilt a couple pints on the first and third Wednesday afternoon of every month. This is no doubt to share their love of what they’re producing but also to generate buzz around the city of what is sure to quickly become one of Calgary’s most beloved breweries. Now all I need is a Village beer in Bangkok!